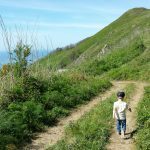 Many parents seem to think that to travel with kids is pointless because they are never going to remember or appreciate it while they are young. I can’t count the times I have heard, “Oh yes we would love to go one day, maybe when the kids are older as they won’t remember it now”. or “Oh I would, but she loves her routine and I don’t want to mess it up”. 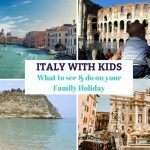 As a parent of two young kids myself I know that travelling with kids is not easy but I don’t agree that it’s not worth it. To the contrary, travel has many benefits for kids no matter what their age and messing up their routine once in a while can do a great deal of good for them. Just because you have had kids, life doesn’t need to stop. Yes, once the little ones arrive we can settle down to a certain extent and enjoy family time. But why can’t that family time mean travelling together. If you loved to travel before, then you can still travel with kids, it just means that you travel differently. Different isn’t a bad thing either. Travelling with kids means slowing down, and seeing things through a little ones eyes. Children view the world much differently than we do. Travelling when your kids are younger means a lap seat on the plane if they are under a certain age, or at least a discount once they need their own seat. Kids travelling on trains and buses usually receive similar concessions. When you are booking into a hotel they usually have family rooms with a porta cot, meaning most of the time the cost for accommodation is minimal for kids. 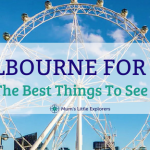 Sight seeing is cheaper too as kids under a certain age are usually free, discounted or you can buy family tickets. As kids get older, they need their own seat, their own bed, and have to then pay full price for attractions and activities while out and about. That’s when it gets expensive travelling with the family. 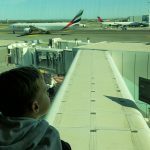 We have done a few long haul flights and it was so much cheaper when our kids were younger. In many schools it is difficult to get permission to take kids travelling during the term time. There are some schools which even forbid it and parents can get themselves into trouble. That’s why travelling with kids before they go to school is the easiest, as you don’t have to travel only during school holidays. Home usually means routine. Getting out of your little home bubble and doing something different can mean a breath of fresh air for both you and your kids. Get out of the routine, explore something or somewhere new. You never know what you will learn from your kids. Visiting new places allows children to explore new types of food, meet new people, and be exposed to different cultures and lifestyles. When kids travel, they learn that not everywhere is like “home” and not everyone is like the people they know. Children learn invaluable lessons while travelling which cannot possibly be taught within a school environment. With travel, children gain independence, confidence, and learn real life skills through real life situations on the road. I never travelled much with my family when I was young, except for within our state. I come from a large family so putting 9 of us on a plane overseas would have been quite expensive, and not to mention stressful for my parents. The first chance I had once I finished university though, was get a one way ticket overseas to explore. And I didn’t come home until 12 years later, with a husband and 2 kids in tow! If kids travel while they are young, and at least see some of the world, they may have less desire to run off and try to do it all later on. Don’t wait until your kids are “old enough” to travel and explore the world, your home country or even the city you live in. 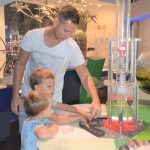 Children are amazingly adaptable to new situations, and travelling with kids can be enjoyable, and beneficial at any age. 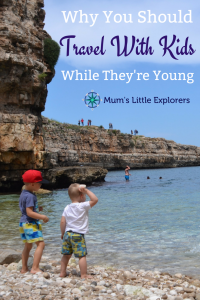 Follow Mum’s Little Explorers on Facebook for more posts! I love this list! But I should say, I have the exact opposite experience with # 7. Childhood travels with my parents gave me the awareness and courage to travel extensively when I got older. My first travel experience took me far, and I didn’t make it back near family for 19 years! I’m pretty sure I’m not alone in that. Most people in my travel circle just get more and more travel-brave as time goes on, with many of us having first got our feet wet in childhood family travels. The upside: if they do travel & move abroad when they grow up, you can go visit them and have even more experiences together!